“This is slash and burn. This is destroy the province,” says Barbara Markovitz, co-chair of the Eastern Shore Forest Watch. Markovitz lives in Calm Harbour on the Eastern Shore where Northern Pulp Ltd. is whole-tree clear-cut harvesting for biomass energy. “Residents in the area are very upset, shocked and appalled,” she says. After whole-tree clear-cut harvesting, the land once covered by forest is barren, with no trees or wildlife. The soil, once protected by trees, can now be damaged by sun and rain. Jamie Simpson, forester with the Ecology Action Centre (EAC), recently visited a biomass and pulpwood harvest site by Northern Pulp Ltd. 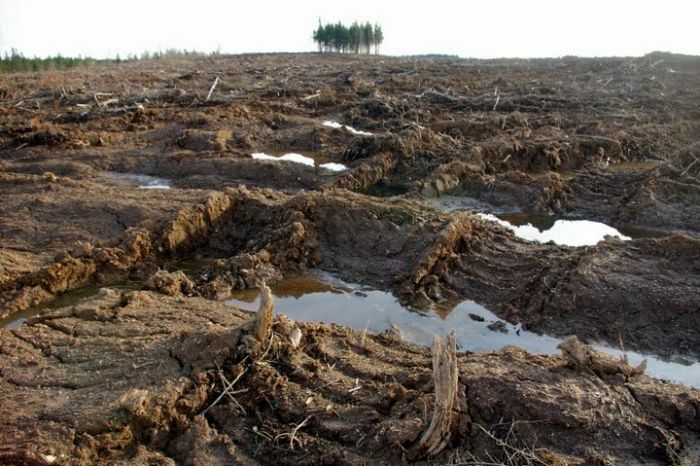 The land near Upper Mosquodoboit is owned by Neenah Paper Ltd.
Biomass is material derived from living or recently living organisms, and whole-tree clear-cut harvesting is “the cheapest way to get biomass material for burning to produce energy,” explains Simpson. 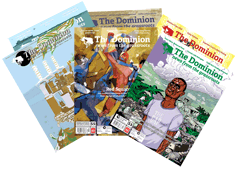 “It proves that we need a regulation to stop companies from whole-tree clear-cut harvesting,” Simpson says. That’s why the Ecology Action Centre, nine other Nova Scotia groups, and the Nova Scotia Woodlot Owners and Operators Association (NSWOOA) are trying to stop whole-tree clear-cut harvesting. Northern Pulp’s operation has been certified as ‘green’ by the Sustainable Forestry Initiative (SFI Inc.), a third-party certification program that was set up by the American Forest and Paper Association. “Typically, the SFI has been considered the less stringent certification option for North American companies,” explains Graeme Auld, Assistant Professor of Public Policy and Administration at Carleton University. The SFI is greenwashing, says Simpson, explaining that the organization is trying to appear more environmentally friendly than it is. Simpson says the government’s response to the EAC and other groups’ demand for legally binding restrictions on whole-tree harvesting has been wishy-washy. “The Minister of Natural Resources said that they won’t commit to no whole-tree harvesting in their modeling of available biomass, but that doesn’t necessarily mean that they’re going to put a regulation against whole-tree harvesting,” says Simpson. “I think the Department of Natural Resource has to realize that we don’t want to sacrifice our soil productivity and wildlife habitats for a little bit of energy,” Simpson says. The Department of Natural Resources has recently received a lot of complaints, including a petition from the nine groups working to combat whole-tree clear-cut harvesting. 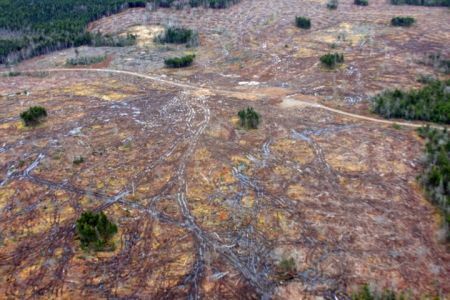 The whole-tree clear-cut harvest near Caribou Mines was a pulp harvest, says Dan Davis, spokesperson for Nova Scotia’s Ministry of Natural Resources. “It wasn’t a harvest for biomass,” he says. But Simpson says whether it was a harvest for pulp or biomass is not the issue. Simpson says while the majority probably went to pulp, “the key issue is around the result after the whole-tree clear-cut harvest was done.” The effect whole-tree clear-cut harvesting has on the land is what people like Simpson are most concerned about. Although Davis said the minister would 'prefer' companies didn't use whole-tree clear-cut harvesting, he confirmed there are no regulations against the practice. Northern Pulp, based in the US, is an affiliate of Atlas Holdings LLC and Blue Wolf Capital Management LLC. John Hamm, former Premier of Nova Scotia, is one of Atlas Holdings’ operating partners. Northern Pulp has a license to 80,000 hectares of Nova Scotia's Crown land, and has an agreement to manage Neenah Paper's 195,000 hectares of private land. On March 26th, 2009, the Nova Scotia Government loaned Northern Pulp $15 million to assist its mill in Pictou. This summer, Northern Pulp whole-tree clear-cut harvested approximately 260 hectares (650 acres). More cutting is planned for this winter. Whole-tree clear-cut harvesting is not the only option. 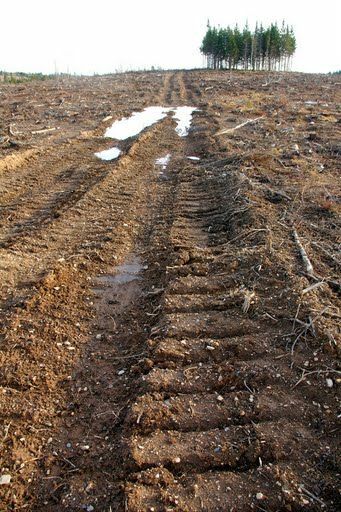 “There are probably many options, but the less biomass per hectare an operation can extract, the less economically viable it is likely to be,” explains Auld. The low economic cost is why there’s an interest in whole-tree removal. Although financial costs may be relatively low, there are many other costs, according to Simpson, including the cost to the climate. With the eight other groups, the Eastern Shore Forest Watch has been notifying the public, writing letters to the government and contacting the media. Markovitz is determined for companies to stop whole-tree clear-cutting. “We will continue as long as necessary and as hard as necessary until some sanity returns to forestry in Nova Scotia,” says Markovitz. Aethne Hinchliffe is studying journalism at King's College and is currently interning with the Halifax Media Co-op. Submitted by Halifax Anonymous (non vérifié) on lun, 12/14/2009 - 11:57. Submitted by antigreenwash on lun, 12/14/2009 - 23:00. Submitted by Michael Stewart (non vérifié) on ven, 01/15/2010 - 12:00. Neenah has no problem with irresponsible forestry on its lands, but the paper products it manufactures are are certified by the Forest Stewardship Council (FSC), an environmental advocacy group for sustainable forestry- figure that out!